...that is the question. At least it was yesterday on the Bibliocasting list. There have been some great discussions about what libraries can do with podcasting and why more libraries aren't actively using the technology. You can read the threads starting here and here. There are lots of great ideas for potential podcast applications! A few posts address concerns about ROI and the issue of do your library users really want content in podcast form. I think we as librarians/ libraries sometimes want to over study, analyze and focus group every potential new service we might offer to our users. Of course we need to make sure that the time and energy we are going to spend implementing new projects is worth it in our particular institutions. But sometimes the focus seems to be on the focus group and making sure that 99.9% of our users know they want a service before we offer it instead of being willing to try new things to reach people. Where they are. This isn't to say that every library should go out and immediately start a podcast, but I think it is OK to go out on a limb sometimes and try stuff. Start an IM reference service, a blog, make a MySpace page. Do it "right" and in an organized way of course. And be prepared to adapt as your users react to the service. And have an exit strategy in case it really doesn't work after all your best efforts. The issue of having to market your services to get an audience was raised as well. This is kind of a chicken and egg situation: how do you know that the needs of your users can be met with a particular new service or technology when your users don't know a particular service or technology is available. I would say that the basic need of most library users is to access information, whether it's for a class assignment or their own personal use. So how do we let them know what tools we have available for their needs and get them assistance in using them? Marketing. Marketing our library services is a huge part of my job as public services "coordinator". I constantly remind classroom faculty to take advantage of our library instruction offerings. New faculty may not be aware of these services or had bad experiences in previous institutions. There are established faculty who aren't necessarily library advocates who need some friendly cajoling to get their students library info. So I talk to them in faculty meetings, in the halls, at events to remind them about our offerings. Marketing. Should we not offer instructional services because a certain percentage of faculty members aren't aware of what we can do for them? Same with students. 90% of kids probably never gave a thought to potentially using IM to get reference assistance. But if the service is available when they need it and they know about it, many are likely to use it. And some of those users might be folks who would never come into the library, no less approach a reference desk. So offer the service, do it right, market it and see what happens. If we don't try to reach out to our users and meet their basic informational needs where they are, we'll keep sitting at the reference desk wondering why the parking lot is full but nobody is in the library. Soooo...back to podcasting. I really do think podcasting requites a greater commitment than starting a blog or an IM service. So definitely think "can this technology help me reach my users?". Either as a marketing or an instructional tool. Is there a wider move towards podcasting at your institution? Get the library involved! To paraphrase Greg Schwartz, don't do it because I'm doing it or it's the cool new thing. But at the same time don't let the need to feel 99.9% certain that a majority of your users are waiting with bated breath for a library podcast (or blog or IM service or instructional program or creative orientation or whatever) stop you from exploring new and different ways to let your users know what you can do for them to serve their primary informational needs. Sure it might fail, but at least you made the effort! All technical controversy aside, the ALA Library 2.0 bootcamp has some interesting looking podcast content available about a wide range of L2 related topics, including the world podcast debut of Meredith Farkas and a discussion of a new podcast studio at Case Western Reserve U. Remember the iPod iNovations Day I went to? Apparently, neither do the folks who put in on since they never got around to putting the presentations online like they promised. Or the video. I did want to point out one great podcast project that got discussed at the meeting. Brian Mumma of the GC&SU Education Department interviews public school students in the Milledgeville area about their thoughts on school and education in a project called "This Adolescent Life". The interviews are used in exposing potential educators to the views of their future students. Unfortunately I can't find a way to listen to the actual content, but there are a couple of interviews about the project on this page and an excerpt here. Mumma played some of the content, including a rap called something like I Hate My Teacher, in the session and they were great! David King runs through some podcasting/ webcasting microphone options in this handy post. Definitely worth a look if you're interested in podcast production. Or are going to be doing any webcasting. I've had my eye on the Blue Snowball for a while. And on a related podcast production note, make sure to check out Greg Schwartz's podcast creation SirsiDynix webinar on Wednesdsay, May 24th. I'll be heading to Chicago that day so no webinar for me. But I believe SirsiDynix does eventually make the content available free online. Due to the start of classes on Monday and being out of town blogging will grind to a trickle for a while. (How's that for a mixed metaphor?) But I'll be baaaack. 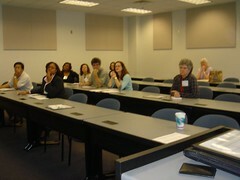 Yesterday I was at Macon State College in Macon, GA to participate in a panel discussion on IM reference at GUGM 2006. For those of you not in GA and keeping score GUGM is a hybrid of the Georgia Voyager users group meeting and an academic library conference. I was lucky to be on the panel with a couple of very knowledgeable and cool librarians, Sarah Steiner and Elizabeth White. We got a lot of questions from the audience and had a great discussion about using IM to reach your users where they live online. 1. Sarah created business cards at GA State to promote their IM service. Cards have their buddy name and are handed out in LI sessions and all over campus. This is a great idea! So great in fact that I'm gonna steal it. Hint hint. 2. Another cool promotion idea - Elizabeth talked about UNC making "Hello, My Buddy Name Is..." stickers to promote their service. She said that she saw them around campus on notebooks, bags etc. Good advertising! There's a pic in Elizabeth's presentation on our website if you want to take a look. 3. An audience member asked us if we were using webcams in our chat reference. My immediate thought was that would take away the "what do you look like and what are you wearing" questions! But he really meant that we could use a cam to show webpages, kind of like non-interactive co-browsing. Interesting idea. Anyone doing something along those lines? As I mentioned up there somewhere, we made a website for the session with PPTs that we didn't actually use, a bibliography on IM reference and a bunch of links. Take a look if you'd like! Great session! Looking forward to repeating it in October at our big state library meeting. Got to meet and have lunch with Brian Mathews too so all in all a very good meeting. Due to some last minute travel money changes, I found out last week that I'm going to be going to ALA in New Orleans this year. Even without Michael Gorman's .....something..... I'm not a huge fan of ALA's value as a professional organization, outside of being able to join ACRL and getting points on my evaluation every year. But maybe that will change with the new president. I did attend the Annual Meeting when it was in here in Atlanta a few years ago and found it to be an OK conference. And there were some decent looking programs this year as well, including a talk by Chris Anderson of long tail fame. And the experience of being in New Orleans less than year after Katrina will be an added bonus. I haven't been sure I wanted to go back and see what's happened to NOLA but now that the opportunity is there, I'm looking at it as a unique experience. I added my blog to the list on the wiki and I'm sure I'll post a good bit as my hotel claims free wifi. Maybe not as much about the sessions as the overall experience though. Looking forward to the bloggers/ LA & Gulf Coast librarians reception too. There should be lots of interesting stories to tell and hear at the conference. Good podcasting opportunity?? OSR: Arlo Guthrie is too easy. Tell me who wrote it and I'll give you some sort of free swag or a beer or coffee if you're going to ALA. Familymembersofdavidsrandomstuffnoteligibleforfreeswagbeercoffee. Great discussion of the Scan This Book article from Sunday's NYT Magazine on Library Garden this morning. Need to spend more time with it before I really have anything to add. Both article and LG post are definitely worth a read. During some downtime last week I followed up on my last social networking post and set up a Facebook page. I don't have any friends from MPOW yet, but it is semester break. One thing I though about after setting up the account was "Ok, now what?" and wondered how other librarians who are on Facebook are presenting themselves and what they're doing with the service. Since Facebook seems to not want you to set up groups outside of your primary network, a librarians group option (like the great ones in Flickr) won't work. So if anyone out there is on Facebook, I would like to be your friend! You can find me by searching "david free". I'm the one at Georgia Perimeter. Maybe if we had enough librarians (and libraries) who were all friends with each other that would be a way to share how we're using Facebook to reach our users. Going through the Bloglines this AM and immediately after reading Meredith's great, thoughtful post on social networking I ran across this post on the LJ Tech blog about a group of our fine congressfolks wanting to force libraries and schools to block social sites and chatrooms. Here's an idea: let's just turn off the Internet everywhere anyone might get offended by anything (or watch Primeline CBS) and be done with it. LJ linked to a good article from Cnet about the absurdity. To quote Stephen Colbert, that's the craziest _______ thing I've ever heard. But anyway, I never got around to talking about library presence in social sites in my previous MySpace post. Putting up library info in social sites can be a great marketing/ outreach tool if, as Meredith points, it's done well. Her examples of good sites are a great model for anyplace looking to communicate with your users that way. I'm not really sure it's right for MPOW though, for a couple of reasons. First, the issue that has gotten raised in these discussions several times about the number and transitory nature of popular social sites. If you go down the social site route, you'll really need to put your information on every site that's out there to reach all your users. That means all the ones we know about today and the next big thing that folks who are waaay cooler than me are probably using under the radar now. Once a site gets too popular, something new is going to come along and draw off the early adopters. And those might be the folks who are more comp savvy and maybe more likely to use your services in the social arena. It just seems to be too much to keep up with. Second, I'm not convinced that social site users are going to communicate with an institution through them. If your library has a MySpace page and it is getting added and used, that's awesome. But from my experiences with our students I don't see it happening here. It could be another way to market our services and events but not really a place where learning will take place. Plus we already market in 100000 other places and I really don't see adding another 10000 (see first point). Buuut I think they may be open to communicating with an individual. So a better route for me might be to put a personal page on Facebook and (hopefully) answer some reference questions. Sure its just one site, but judging from the number of students who are browsing it during LI sessions and on our library comps that's where most of our students are. I don't think I'd feel comfortable doing the level of procative outreach that Brian Mathews descibes (although I don't necessarily find what he does intrusive), but I do think that students are at least somewhat likely to interact with me there. I already get all kinds of informal (ie not in the library or classroom) questions from students in the student center and walking around campus. Mostly at assignment time, but they have no problem with privacy boundaries when I'm eating lunch or heading the call of nature so hopefully it wouldn't be an issue the other way around in an online environment. "...I wonder if they really believe that parents, teachers, administrators, potential employers, etc. won’t find them there. I wonder if they have a false sense of security." I'm not sure I would call it a false sense of security, but a lack of understanding that not everyone shares or values the openness that social sites tend to bring out. That posting half naked drunk pics of yourself when you're in college might somehow effect your life when you're trying to get a job. But maybe that's what a false sense of security is! So the personal Facebook route might be what works for my library as far as social networking presence goes. Or at least it seems the best route to try. And for some strange reason there are more people in here asking questions the day after finals than there were yesterday! Go figure. Greetings from the last day of finals. Spending the afternoon watching three people study and doing some emailing. This is always a weird time in academic libraryland, right after the research paper rush and before the actual break when you can make noise moving books and things around. We spend several weeks with a steady stream of people who desperately need to find 3 books and 5 articles on the culture of Samoa and then nothing. Not even a "How do I print from wifi" or "Why do I have to use a swipe card to make copies". Although I don't really miss the copy questions. But at least people are using us as a study hall. And are actually studying. No sleeping bags, coolers and coffee maker like a future panel colleague had this week but still a good number of folks pouring over the books. And even more taking advantage of our 1 extended evening hour than any previous semester, probably saving the extra hour from extinction. We did get several folks stop by the desk this week to say thanks for helping them with their papers and letting us know how they did though. I'm always fuzzy on exactly what I helped them with (even though they assume that I remember as though it were yesterday) but it's very cool that they appreciate the help. Of course we'll miss the quiet in a week or 2 when the copier questions start up again! Note: More of an obscure album reference this time but it can share the category. News is circulating around the blogosphere today that John Iliff of PALINET passed away last weekend. John did a huge amount of work promotion emerging technologies. I had the opportunity to meet him briefly at Computers In Libraries and talk a little podcasting. His presentations, both in person and online, conveneyed a great enthusiasm about libraries and technology. He was able to speak to both the techie and non-techie at their level and get everybody excited about his topics and working in libraries. I was going to have the opportunity to work with him later this year and will definitely miss that interaction. PALINET has a condoleneces page. He will definitely be missed. Apple can still us its apple logo on iTunes, according to a ruling today. 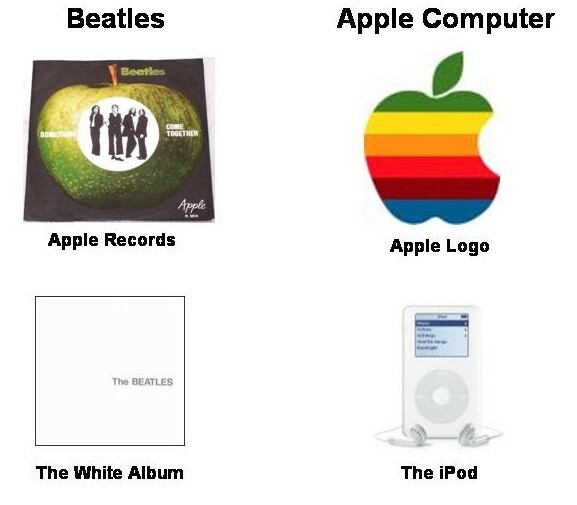 The Beatles had clamied that the use of the logo in a muscial context violated a previous settlement over the use of the apple logo, which does kinda but not really look like the Beatles Apple Records logo. This probably won't make the Beatles any more likely to license their music for online purchase, but who knows. In other Apple news, my new iBook G4 is getting a tour of Atlanta on a FedEx truck today. I was sort of in the market for a new laptop so I decided to go the Mac route this time. I'm going to start experimenting with Garageband for some of my podcast production over the summer, which will hopefully lead to some cool new stuff. I've always used PCs so the new laptop will be an interesting transition. Apple has new ads featuring John Hodgman too. This has absolutely nothing even remotely to do w/ libraries but I just found out that Blue Oyster Cult is playing 2 miles from my house in September. At a drive-in. I'm giddy. Does that make me a geek or a nerd?? Just saw this post on LibrarianInBlack about the UC-Berkeley iTunes U project. Someone mentioned this in a podcasting conversation in the past week or so and I completely forgot to look at it. Berkeley is definitely taking a more open approach to making course content available through iTunes than most schools. A few allow open access to certain courses, like the Purdue BoilerCast project, but nothing on this scale. I doubt that many will follow the lead but it is very cool that one of our major universities is taking that route. Sorry for the lack of blogging this past week. As I mentioned in the last post I'm teaching an online class this summer so been spending most of my non-reference desk time working on developing the class. And doing the podcast. The class is non-descriptively called ATEC 1203, for Applied Technology. It's a one credit class covering computer basics like Word and PowerPoint along with basic Internet and library research skills. Librarians often get asked to cover the Internet and library units in F2F sections on various campuses but I've never taught the whole class. Or taught online before. Developing the content so far definitely gives me more respect from instructors who teach distance or online classes. The course is relatively simple: there's a book developed by a local committee that all sections use so the material is all right there. But even just getting the basics organized in WebCT Vista is very time consuming. Not to mention working on getting the content that would be delivered in a classroom lecture together and translated into an online learning experience. I've got the basic content pretty much done so now just a matter of making it a little richer and finishing some of the assignments. But a lot of that I'm going to do on the fly during the semester. Anyone out there who has done some online teaching have any advice or tips?